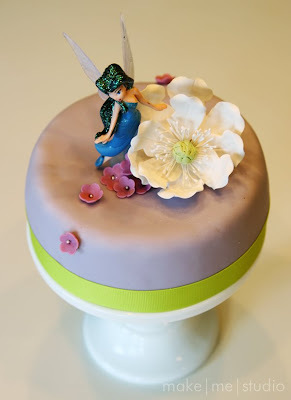 I made a 6" round mini cake for my niece's 3rd birthday with a left over fairy from the Tinkerbell package and some other "left over" items. I was going for ultra easy and fast. I think this one might be even cuter than the Tinkerbell cake. Maybe just a little more sophisticated I guess. Not too 3-year old like, I guess. "Silvermist" is the fairy of water for those not properly educated in fairies. I love this! Do you mind me asking where you got the cake stand? It all displays so beautifully. Thanks! ineed to know how you made this my daughter loves silvermist. I would love to know where you got the cake stand as well! 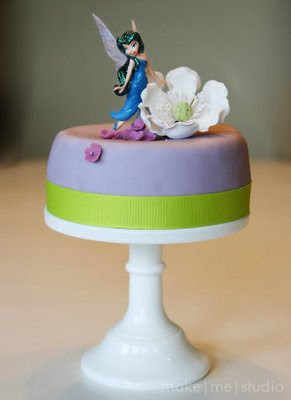 It is perfect for this beautiful cake!! !